Venezuela is for sale. President Nicolas Maduro’s government is clinging on through the country’s slow-motion economic collapse, but looming over its day-to-day survival tactics of brutal repression and political imprisonment is a growing mountain of debt. The fierce president’s attempts to stave off default have worked so far - but at a cost to the people of Venezuela and the country’s financial independence, the magnitude of which is spiralling beyond imagination. The government and the state-owned oil company, PDVSA, owe roughly $70 billion, of which $3.5 billion is due by November. 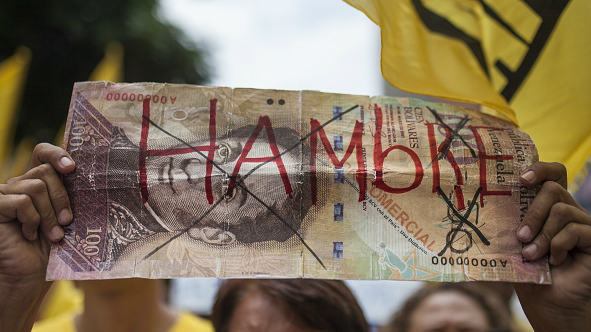 Mr. Maduro is scrambling to come up with the money, but time is running out to pay it off. Even if he does manage to cobble together a solution, it will likely be a temporary one at best. Caracas and PDVSA must pay back around $13 billion by the end of next year, yet its foreign cash reserves have sunk to less than $10 billion. It is little wonder that financial markets put Venezuela’s risk of defaulting in the next five years at 98%, according to Bloomberg. A default might not necessarily unseat Mr. Maduro. History, at least, can offer him comfort on that front. Venezuela has defaulted ten times since the turn of the 19th century - a record matched only by Ecuador - yet not once did it lead to the downfall of the government in charge. The government has not survived months of sky-high inflation and crippling shortages without good reason. Venezuela’s powerful military has so far carried the government through waves of popular unrest, and there are few signs of it withdrawing its support any time soon. Venezuela’s inflation rate is set to pass 2300% next year, according to IMF estimates. Nonetheless, the increasing desperation of Mr. Maduro’s attempts to avoid defaulting suggests he does not want to take any chances. In recent years, he has managed to stay just ahead of his debt obligations by restricting imports of essential goods such as food and medicine in order to hang on to the foreign cash reserves needed to pay his creditors, primarily in the US, Russia and China. This summer, the government sold $2.8 billion worth of PDVSA bonds, in a deal that raised $865 million in cash but committed it to paying out $3.65 billion by 2022. Venezuelan blog Caracas Chronicles compared it to “selling the electric wiring in your own house for scrap to get high on meth”. Just a week later, Venezuela’s first issue of government bonds since 2011 - $5 billion worth - reportedly ended up being offered at 20 cents on the dollar on a Chinese brokerage. The sale, an obscure, off-market arrangement, is thought to leave Venezuela on the hook for $11 billion by 2036 in return for $1 billion in cash now. Ultimately, a default could lead to creditors seizing their money from PDVSA through the courts. If that were to happen, Venezuela would lose its only economic lifeline. How will its soldiers see their government if it can no longer pay them? President Maduro is between a rock and a hard place, and he is rapidly running out of space. It is unclear how much more room the government has to cut imports. Food shortages are at the heart of a worsening humanitarian crisis in Venezuela, and a starving population can only fuel the country’s political crisis. At the end of the summer, the Trump administration ramped up its sanctions to include a US-wide ban on any new bonds issued by Venezuela’s government and PDVSA. The government has previously negotiated down payments for its oil with Russia and China, which it could try to do again. As an increasingly poor investment, however, can Venezuela count on more generosity? 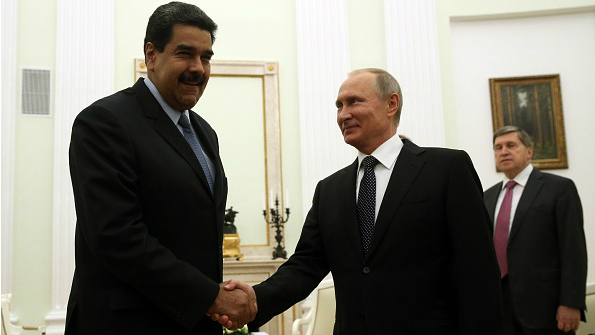 On his visit to Moscow last week, Mr. Maduro thanked Russian President Vladimir Putin for his support through “difficult times”. Russia has reportedly helped Venezuela with billions of debt payments over the last two years. Moscow has plenty of its own economic problems, however, and will be wary of over-exposing itself. When Caracas part-missed a payment to Moscow earlier this year, the Kremlin was forced to slash its state budget projections by $1 billion. Mr. Maduro insisted Venezuela was paying its dues, but strongly hinted at his wish to discuss restructuring its $1 billion debt to Russia. That would still leave him far short of the $3.5 billion he needs to find over the coming weeks, however. But senior officials in the Trump administration have reportedly suggested that Russia could be drawing up another rescue plan. “Russia cannot back away. It’s already waist deep,” says David Smilde, senior fellow at the Washington Office on Latin America. A Chavista Venezuela offers more than just money to Mr. Putin, he argues: having an anti-US, authoritarian “beachhead” in the Western hemisphere is hugely appealing to Moscow. “Russia doesn’t have much more to put into Venezuela, but it will do what it can,” Mr. Smilde told The World Weekly. Should that not prove to be enough, Venezuela will have to look to its biggest creditor: China. Its geopolitical interests are not quite the same as Russia’s, however. China’s main goal will be to protect the significant interests it has racked up, including $60 billion in loans. China may opt to wait the crisis out and let Mr. Maduro fend for himself. Huo Jianguo, vice-chairman of a think tank affiliated with China’s Ministry of Commerce, told the South China Morning Post that most Chinese investors and workers in Venezuela had left the country. He suggested that Venezuela may come to be seen as a lesson to be learnt for Chinese overseas investment, rather than an asset to be recovered. Wherever they come from, however, each new last-minute rescue plan must come at a greater price than the last. Mr. Maduro has already pawned Venezuela's economic future through his bond fire sales, leaving only its oil wealth to bargain with. A $1.5 billion loan from Russia’s state-owned oil giant Rosneft at the end of last year resulted in Venezuela forfeiting 49.9% of Citgo, a US-based unit of PDVSA, as collateral. Russia now appears to be making Venezuela pay its dues by shipping oil to India, where Rosneft recently bought a refinery. This amounted to 172,000 barrels per day in August, a threefold increase from July. Some industry figures believe this puts Venezuela on track to pay Russia around $250 million per month - just about enough to keep the Kremlin on side. Yet that still leaves the billions more that will be due next year. Mr. Maduro and his government argue that they are the victims of a Western conspiracy to undermine their Chavista project. “The people of Venezuela will respond with dignity and firmness to the imperialist attacks, to guarantee the economic sovereignty of the country,” Mr. Maduro tweeted in response to the latest round of US sanctions. But with so much of Venezuela’s main export servicing the government’s debt rather than its people, it is difficult to see what sovereignty he might have been referring to. A proud nation is now indentured. Tens of thousands of Venezuelans have reportedly fled to neighbouring countries out of desperation, with many more expected to follow. Perhaps Venezuela has already been sold, and to the lowest bidder.